This trail hugs the lakeshore for a while then passes close to Highway 299, but only for about 300 yards. The trail again follows the lakeshore most the rest of the way and ends at a day use parking area near Carr Powerhouse. Part of this trail once provided water to mining operations in the Clear Creek area during the gold rush era in the 1850s. Why would a water ditch be constructed next to a lake? (Remember the lake itself was not constructed until the 1960s.) Over 100 years ago a series of ditches and flumes crisscrossed these lands to move water. This water system allowed miners to work year-round. Some of the ditches were filled in to make pathways like this one. The canal, now converted to a trail, is wide and flat in most places and provides easy access to the shoreline for those who would like to cool off with a swim. It is popular with both hikers and mountain bikers. Runners enjoy its peace and the chance for quiet reflection as they jog during the early morning and evening hours. In addition, the trail offers several good fishing spots. Fishermen pull trout, bass, and catfish out of the lake. Early risers may see bald eagles fishing on the arm of this lake. Great blue herons are often spotted in the little coves and marshy areas near the lakeshore. Look for western pond turtles sunning themselves on logs jutting out of the water. Foothill and knobcone pines, manzanita, and several types of oak provide a fair amount of shade along the trail. Small seasonal streams also keep it cool. While following the trail along the shoreline, look across the water and notice Shasta Bally, the tallest mountain in the park at elevation 6,209 feet. In some years there is still snow at its higher reaches in July! While hiking next to Highway 299, notice the contrast of northfacing Shasta Bally, compared to the south facing slopes. Thess slopes are covered almost exclusively with manzanita. Note the influence that direction (and also topography) has on the plant communities present. Together, these two factors can also create interesting micro habitats. Hikers will observe some interesting wildflowers along the trail. Indian Warrior, a unique flower, is present from late winter to early spring. One can picture its dense spike of blood red tubular flowers as an Indian headdress. The leaves clustered around its base are purple tinged and fern-like. Another unusual flower is Calochortus, or hairy cat’s ear, which appears in late spring. It takes its name from the shape of its white petals and the dense, dark purple hairs within. A member of the Lily family, each plant has just one long leaf and one to seven flowers per plant. 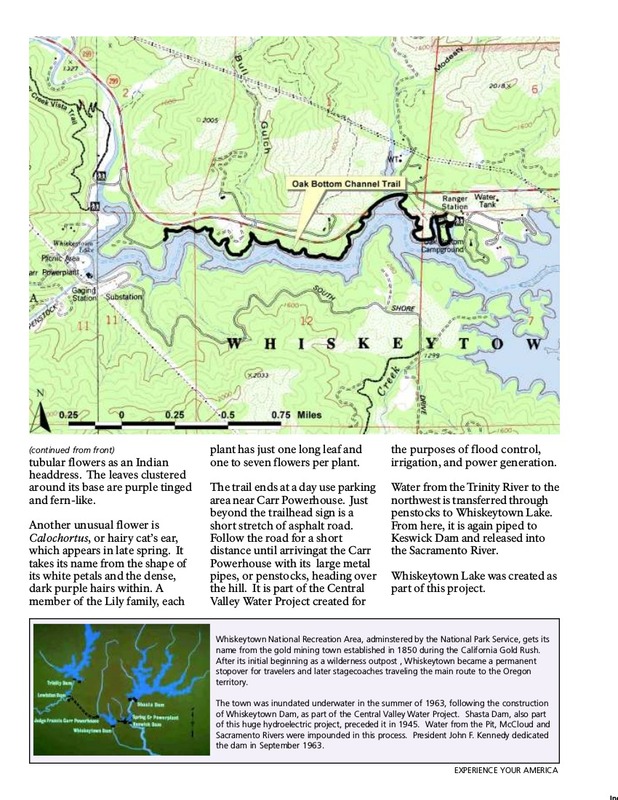 National Park Service data sheets included within. Starting at the Whiskeytown Visitor Center drive west on Highway 299 approximately 5 miles until arriving at the entrance to Oak Bottom Campground. Turn left here and follow the road for a short distance until noting the sign for Oak Bottom Water Ditch Trail on the right. It is just before the campground store. Parking is right next to the trailhead. 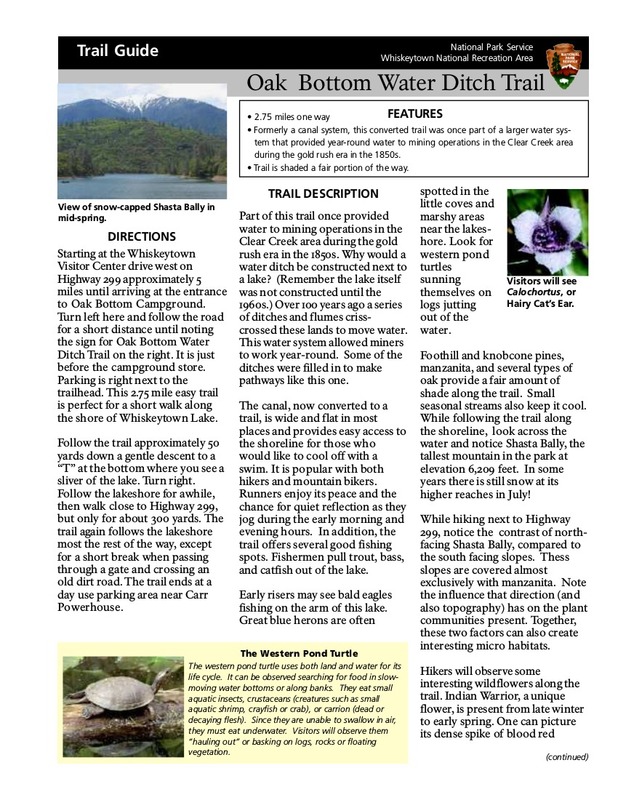 This 2.75 mile easy trail is perfect for a short walk along the shore of Whiskeytown Lake.